How does a Product acquire a Minimum Viable Personality? I’d say that a product has a minimum viable personality when it has just the right combination of features to deterministically resonate with your target customer. There are easier ways to know what Minimum Viable Personality is, such as by reading this blog post written by a Giant Robot Dinosaur, or by constantly looking out for product launches and then going A-ha when you find one. I can only guess which one of the above will lead you to the right answer. A product with a MVP is very valuable as an effective market probe. Start with this burning question about your customer – how will your product change her life? Now reduce your product vision to a handful of steps that if the user were to finish – she then has done the bare minimum to experience reaching the end goal you designed it for. Right after that she can choose to go on and spread the word. Repeat this process and worry less about features such as registration. With the inessential clutter gone, focus is clearly on getting users to follow a set of well defined steps. By measuring how many users finish, the product delivers a clear answer to the burning question. 1. HOW THE TEST CHANGE CUSTOMER’S LIFE? 2. WHAT STAPLES STANDS FOR? 3. WHO OR WHAT STAPLES HATE? To find another product with MVP, we go digging into web history. 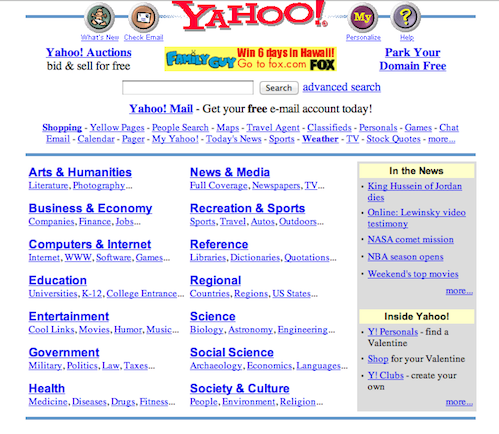 Here’s Yahoo’s home page in 1999 with a generic collection of links. Yahoo.com in 1999 – A Rock? 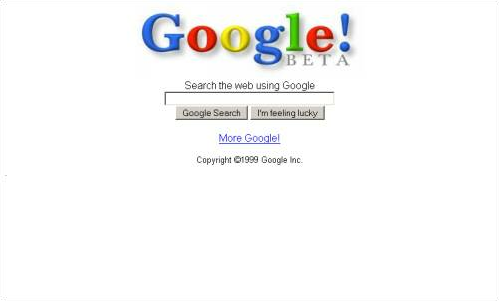 In contrast, Google.com’s stark 1999 home page design and a single call-to-action was optimized to learn what do users want to search for. Google.com 1999 – DEFINITELY NOT A ROCK. Geeks like me loved searching on Google over anywhere else. You can see how the home page evolved to this version on the Wayback Machine blog – Google.com 1997 to 2011. With every step, features that did not matter to the growing audience were dropped. Interaction with this simplistic search page made it possible for much bigger ideas such as the long tail of search to come in later. To discover more about what minimum viable personality really is, don’t limit your imagination to products or applications. Even a simple email address or username can have a minimum viable personality enough to arouse curiosity in the minds of your audience. Consider Andy Johns’ twitter handle – ibringtraffic. Not surprisingly, Andy manages user growth at Quora!